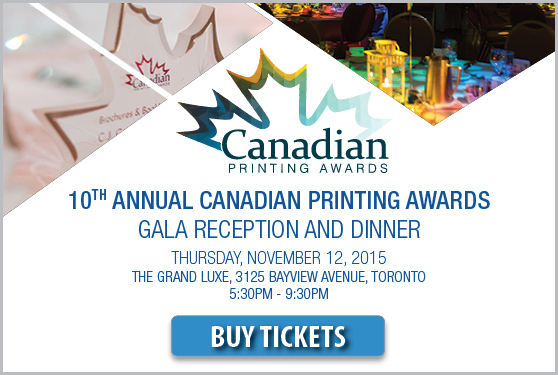 Join us for the Canadian Printing Awards. Buy Tickets Today! View As Webpage | If you visit any links we will provide your subscription contact info (not your email) to the advertiser or sponsor. The Canadian Printing Awards are the nation's most prestigious awards, paying tribute to the success and innovative approaches of Canadian printing companies. Now in its 10th year, the awards gala attracts more than 250 industry leaders, who have demonstrated world-renowned quality in printing output, environmental stewardship and industry achievement. Attend this Gala Reception and Dinner and connect with leading and emerging industry decision-makers within the Canadian Printing sector. Buy tickets before October 30, 2015 and save money. Both individual tickets and corporate tables are available for purchase.